A toothbrush is a dental instrument used for cleaning teeth, ideally in conjunction with toothpaste or mouthwash. The toothbrush consists of a plastic handle and nylon bristles attached to the head of the brush. Contemporary designs offer a variety of styles and shapes in a market that has swelled to $600 million in the mid-1990s, in part because of price increases, but also because toothbrushes are replaced frequently. On average each person in the United States purchases three toothbrushes every two years, although the American Dental Association (ADA) recommends that brushes be changed every three to four months. The best-selling toothbrushes during the 1990s were the Oral-B brand, produced by Gillette Co.; a range of toothbrushes from the Colgate Palmolive Co.; and the Reach toothbrush made by Johnson & Johnson. Modern medical research has shown that brushing teeth properly can prevent cavities, gingivitis, and periodontal, or gum, disease, which causes at least one-third of adult tooth loss. Gum disease occurs when plaque builds up, forming a gelatinous film that coats the teeth and gums. Plaque consists of about 75% bacteria, and it grows quickly. If teeth are not brushed correctly and frequently, it could lead to the calcification of saliva minerals, forming tartar. Brushing one's teeth has long been considered an important part of dental hygiene. As long ago as 3000 B.C. ancient Egyptians constructed crude toothbrushes from twigs and leaves to clean their teeth. Similarly, other cultures such as the Greeks, Romans, and Indians cleaned their teeth with twigs. Some would fray one end of the twig so that it could penetrate between the teeth more effectively. By the 15th century the Chinese had designed a more sophisticated toothbrush complete with a brush attached to a handle. A century later the English nobility were using toothbrushes fashioned out of silver. Toothbrush design has gone through few substantial changes in its long history. Until the early 1900s, toothbrush bristles were generally made of Siberian hog hair. But in 1938, the soft-bristled Miracle Tuft Toothbrush was invented. Within a decade, Oral-B was mass producing soft-bristled toothbrushes. In 1961, the electric toothbrush was introduced. Beginning in the late 1970s, the toothbrush industry started churning out a variety of new designs. They included variations in bristle shape, size, and texture, as well as unconventional handle styles. By the 1990s, countless styles of toothbrushes filled the shelves of supermarkets and drug stores, many claiming their superiority over other brands. Consumers could choose from toothbrushes with soft or hard bristles, with natural or synthetic bristles, and in a variety of sizes, colors, and configurations. For instance, the Reach toothbrush by Johnson & Johnson was the first toothbrush designed with an angled handle which was intended to make brushing back teeth easier. A later variation on the Reach brush included bristles in a zigzag design. The injection molding process involves forcing melted plastic pellets into a toothbrush mold and cooling it. The handle, head, and even the small holes are automatically formed. toothbrush that signaled the user to buy a new brush. The tips of the bristles were coated with a blue dye that would fade to white after about four months of use. The Oral-B Plaque Remover featured taller, contoured bristles that Gillette claimed massaged the gums. SmithKline Beecham designed the AquaFresh Flex, with a flexible, angled handle intended to reduce the pressure put on gums and teeth. An environmentally sound toothbrush was designed by Jack Hokanson. His Hoke2 brush featured a non-disposable handle with a replaceable bristle head. Some of the most uniquely shaped brushes include the Radius, which featured a wide handle designed for an easier grasp and a large, shoe-brush shaped head packed with bristles. The Collis Curve toothbrush featured bristles which curved inward so that they would hug the teeth, allowing the user to brush the front and back of the teeth at the same time. Improvements in electric toothbrushes included battery-operated models, rotating heads, and tufts of rotating bristles. 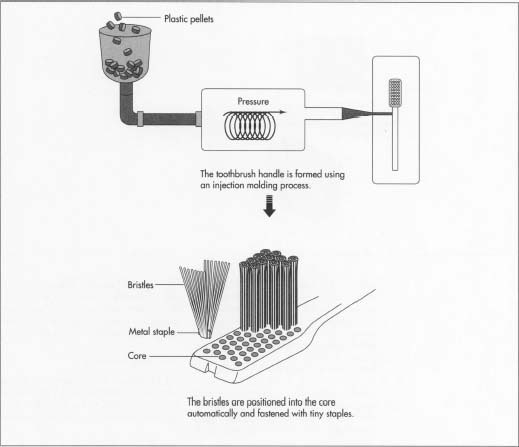 A hightech electronic toothbrush, called the Interplak, featured two rows of bristles with tufts that would spin at 4200 rpm, constantly reversing direction, and pulsating against the teeth. The Interplak, as its name suggests, was designed to remove plaque. effective if properly used, great strides have been made in specialty toothbrushes. For instance, electric toothbrushes are helpful for individuals with limited mobility or dexterity in their hands, such as people afflicted with arthritis. Other special designs include interproximal toothbrushes, which have small triangular brush heads that can clean under fixed bridges and in between widely spaced teeth. Smaller sizes are also available for people with smaller mouths. For people with highly sensitive teeth, toothbrushes with extra-soft bristles made of polished nylon are available. Contemporary toothbrushes are produced mechanically. Generally, toothbrushes consist of plastic handles and nylon or natural boar bristles. 1 Plastic is mixed and shaped into pellets. The pellets are then placed in an injection molding machine, which heats the plastic until it is melted. A rotating screw or plunger forces the liquid plastic into the handle molds. The molds form the entire handle, including the small holes, called cores, into which the bristles are inserted. The molds are securely clamped, and pressure is applied to the molds while the plastic cools. Once the molds have adequately cooled, the clamps are removed, and small pins push the handles out of the molds. 2 The bristles, which are usually made of nylon, are positioned into the core of the handle automatically. The bristles are then stapled into the core with tiny metal staples. 3 Next, the toothbrush passes through a trimming machine which slices the bristles to the correct length and shape for the particular design. 4 The toothbrushes are packaged into cardboard and/or plastic containers. Labels are attached to the package, providing product information such as bristle hardness, as well as recommendations for usage. If the brand is approved by the American Dental Association, the Seal of Acceptance is also stamped on the container. 5 Finally, the packaged toothbrushes are bundled into larger shipping boxes or crates and transported to distributors. The American Dental Association tests a number of toothbrushes and other dental products each year. The ADA measures the efficiency and comfort of toothbrushes and those which meet with their standards are awarded the "ADA Seal of Acceptance." By the mid-1990s the ADA approved more than 45 different toothbrush brands. "New Ways to Save Your Teeth?" Consumer Reports, August 1989, pp. 504-09. Deveny, Kathleen. "Toothbrush Makers." The Wall Street Journal, October 22, 1991, pp.B1, B10. —. "Today's Toothbrushes." The Wall Street Journal, November 10, 1992, pp. B1, B9. Higbee, Beth. "The Great Tooth-Brush-Off." Prevention, March 1994, pp. 53-55. Pierson, John, "Form and Functions." The Wall Street Journal, June 11, 1991, p. B1.